Water Scalping-Classifying Tanks can help you do all these things to become more productive and more profitable. Water Scalping-Classifying Tanks were first used to remove excess water. The water and most silts from a dilute slurry feed overflow the weirs. 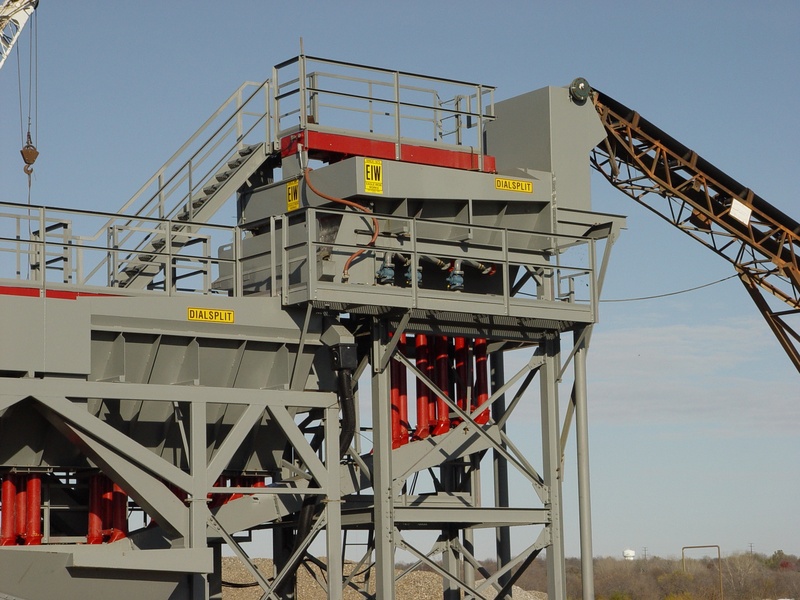 Scalping the excess water from the feed makes further processing of the material easier. For example, removing the excess water allows use of Fine Material Washers without losing the finer sand grains. Because they can handle a low percent solids slurry, Water Scalping-Classifying Tanks are ideal for dredging and pumping fed sand plants. 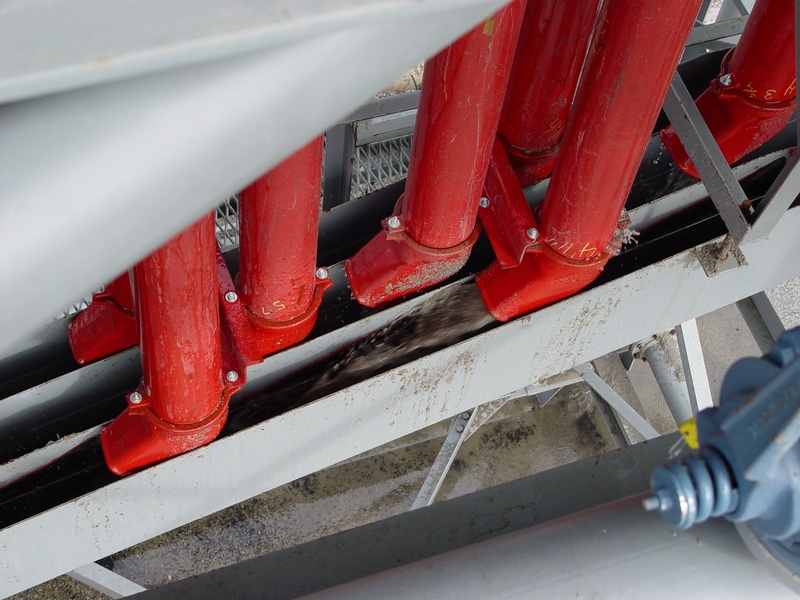 The second function of Water Scalping-Classifying Tanks is to provide hydraulic classification of the feed material into products typically suited for construction specifications. It does this through the material’s own settling properties, discharging larger to smaller sand sizes into several stations. Water Scalping-Classifying Tanks are designed with a long, narrow tub that is divided into sections called stations. As the sand and water mixture enters the feed box of the tank, it is given an upward kick to keep the finer sands from settling in the first stations. The coarser material settles in the first stations because it is heavier and sinks faster. The medium material settles out next, and so on down the length of the tank. With the large-sized material at the feed end, the medium-sized material in the middle of the tank and the smallest particles farthest from the feed end of the tank, the result is a distribution of the various sizes known as hydraulic classification. The different sizes are then discharged from each station to create various products. Each station is equipped with two, three or four discharge valves. Once the material at each station accumulates to a depth that stalls the motion of the rotating paddle in that station, the valves open to discharge a pre-determined percentage of the station’s contents to a collecting flume. The collecting flume has up to four cells for blending products: one creates a residual product, and the remaining one, two or three cells produce a controlled product. For example, a two-cell tank creates one controlled product and one residual product. A three-cell tank creates two controlled products and one residual product. A four-cell tank creates three controlled products and one residual product. The third function of Water Scalping-Classifying Tanks is the reblending of material to meet project specifications. The Water Scalping-Classifying Tank reblends the material by removing excess sizes with regard to the specification of the final product. This is accomplished by the length of time the valves at each station remain open, unleashing material to the collecting flumes. If more material exists at a particular station than is necessary for a specification product, the excess material can be used to blend a second in-spec product or it can be sent to the residual material flume. Further dewatering can be accomplished with a Fine Material Washer following the Water Scalping-Classifying Tank. Water Scalping-Classifying Tanks make fines retention easier because of their large settling area. Fines retention in a Water Scalping-Classifying Tank is based on the principle that the ratio of the surface settling area to the volume of water supplied determined the mesh size large enough to be carried out with the water overflow — more water equals a coarser split. For example, a 48’ x 12’ Water Scalping-Classifying Tank supplied with 2,000 gallons per minute or 454m3 per hour of water will retain 200 mesh or .100mm sand. If you supply 4,000 gpm or 908m3/hr to that same size tank, you can retain 150 mesh or .075mm sand. 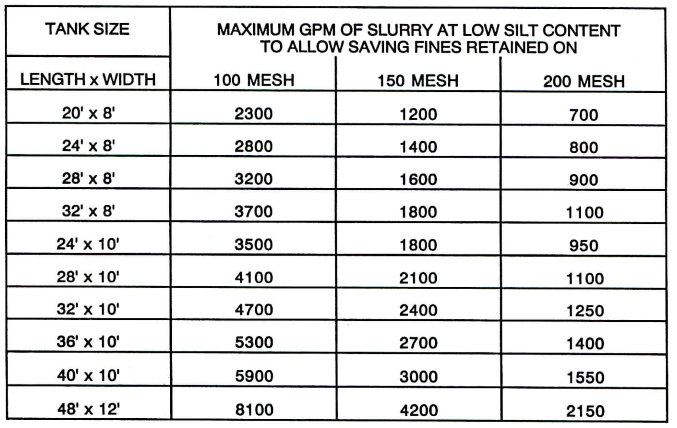 For examples of the water needed for fines retention with other tank sizes, refer to the table below. Water volume is an important factor in the successful operation of Water Scalping-Classifying Tanks. To determine the flow volume on your tank, measure the overflow depth at the weir and compare it to the table below. Make sure the weir plates are level so you can obtain an accurate flow volume estimate. As a general rule, 5/8” or 16mm of water depth over the weirs allows 200 mesh or .075mm fines to be retained and 1-3/4” or 45mm retains 100 mesh or .150mm fines. Don’t use less than the minimum recommended volume of water because it may result in poor hydraulic classification. Using less than the minimum recommended volume of water causes fines and silt to settle at the coarse end of the tank as well as along the sides of the fine end of the tank. Eventually, these fines and silt will bridge over and completely bury the discharge valves. If your Water Scalping-Classifying Tank is not performing its intended tasks, each issue should be individually addressed. If your unit is not removing excess water, creating several product sizes or reblending the material to meet project requirements, troubleshooting the machine can offer a solution to a problem and get your tank back up and running the way it should. Before performing any maintenance, repairs or replacements on your Water Scalping-Classifying Tank, be sure to read and understand the Installation, Operation and Maintenance Manual; read and follow all safety tags; and follow the appropriate lockout/tagout/blockout procedures. For example, if the valves at a station will not open, inhibiting both product creation and reblending, you could be dealing with an electrical issue, a burned out motor, electrical fault, contaminated oil or a faulty part. Inspect the wiring and programmable logic controller, motors and hydraulic lines restriction. Replace or repair as necessary. If hydraulic line restriction is the cause, it could be due to a contamination of the system, either from water, dirt, sand or the wrong oil. If the hydraulic system is contaminated, you need to drain and flush the system and can do so in most cases using suitable cleaning agents. To ensure complete cleaning, allow the valves to continue opening and closing as they normally would. Install a new pressure line filter once the system has been cleaned and refilled. Best practices call for draining and flushing the system once a year or every 2,500 hours of operation. If you experience poor separation of material at the feed end of the tank, you could be dealing with low water volume from the pump, a worn feed box opening or elevating lip on the feed box, or feed slurry deflecting from the side of the feed box. First, check the water volume in your Water Scalping-Classifying Tank. If the water volume is too low, add the appropriate amount of water to obtain the desired split point. If the water volume is at the appropriate level, check the feed box area for signs of wear. If the feed box area is worn, rebuild the feed box to the manufacturer’s original design. If both the water volume and feed box seem to be in good shape, look at the feed entrance itself. The feed entrance to the feed box should be directed to utilize the full width of the feed box, with the direction of flow with the length of the tank. If your Water Scalping-Classifying Tank is overflowing a large amount of fines with the wastewater, it could be because the water is dirty and/or because there is an excess of water. First, check the specific gravity of the water. The specific gravity should be between 1.0 and 1.05. A sufficient water supply is needed to maintain this range. If the specific gravy is in the correct range, check the volume of water in the Water Scalping-Classifying Tank. Consult the Installation, Operation and Maintenance Manual for the appropriate water gallonage and split point for your material. To further troubleshoot your Water Scalping-Classifying Tank, download the Troubleshooting Guide. Be sure the power is switched on for both the control and hydraulic power unit. Be sure you don’t have any blown fuses, if applicable, and that a circuit breaker has not tripped. Be sure the control cables are connected correctly. Be sure the oil in the hydraulic power unit is full. These tools will help you perform any maintenance required as a result of routine inspections. Your Water Scalping-Classifying Tank was designed specifically to remove excess water, create multiple products from a single feed and reblend material to meet project requirements. It can help you make money if, in turn, you help it operate at peak performance. Together, you and your Water Scalping-Classifying Tank can make the most product at the required specification, while removing excess water to make further processing easier. Don’t miss a future post from Eagle Iron Works! Subscribe today to learn what Eagle Iron Works equipment can do for you!